As we get closer to our Farndale Macbeth opening, we want to introduce you to some of our cast and crew. First up is Steve Scott. Steve has been a fixture in the MCCT and BPP worlds for years, but his role in Farndale is unlike anything he’s ever done before! What brought you to MCCT in the first place? A former President of MCCT, Eric Anderson, saw my silly theatrics when I taught children’s classes at my martial arts school. In 2012 he asked me to play the role of “the fireman” in “Studs Terkel’s Working: The Musical”. I loved it. Why did you want to be a part of Farndale? The role of Peach offers me a chance to stretch out and test my range as an actor. The wardrobe, the makeup. I’ve been getting a LOT of help with that! What is something unexpected that you’ve learned by being a part of community theater? It isn’t so much what I’ve learned but who I’ve gotten to know. I’ve met some outstanding people through my years at MCCT. What is your favorite thing about this show? It’s tremendously funny. I acted in four of MCCT’s Shakespeare productions and get the biggest kick out of seeing a farce built around “The Scottish Play”. What is your biggest challenge with this show? What would surprise the audience to know about you? In real life I’m Mr. Peach’s antithesis. If I can make Steve Scott disappear and become a convincing George Peach, I’ll count it a success. Farndale opens April 12 at Stages Bloomington. Tickets are $15 and available now. Get yours here! During her long, construction-heavy commute from Indianapolis, Jessica Joslin has plenty of time to think about her Uncertainty alter-ego, Allison, and what it means to step back on stage after a long hiatus. How did you get involved in MCCT? What made you audition for this show? Emily McGee has been trying to get me involved with something in theatre down here for several years. I think she had just about given up on me when I came to audition for this. How long have you been acting/involved in theater? I started Meisner training in spring of 1999. I haven’t been on stage in 17 years prior to this production. What do you do when you’re not rehearsing? Rehearsing. But this time, music. I’m a frontman and bass player for a rock band in Indianapolis. I’m also in graduate school, preparing to test for my LMHCa License to be a mental health counselor. What has been an unexpected challenge of this production? The commute. I drive 1.5 hours to and from rehearsals, and I have a big part in the production. I’m in most rehearsals. That construction!!!! Whew! What has been most rewarding? Being here, going through the process again for the first time in so many years. I think theatre, once in your blood, never leaves. My theatre life was dormant for years. I constantly waged the battle to beat it silent after seeing shows and volunteering for local theatres. It was like laughing again for the first time in a year or something to be able to do this work again. Why should audiences come to see Uncertainty? It is just so darn funny. I mean, when you work on a comedy, you get used to each other’s jokes because you’ve heard the script a million times. However, in this play, the way we all work together, we are constantly laughing in fresh places. This show sounds and looks different every single time we run it. Our director is a genius that way. She just throws all of us in the same soup pot without telling us what the finished dish is supposed to be. So you might get beef stew and you might get chili. No matter what, every drop is just a pleasure. What are your top three dream roles? I would love to do Laura from The Glass Menagerie before I start looking my age. I love any Ibsen and Shaw roles, and can’t wait to truly hit middle age just to be able to be a great Virginia Woolf. I’d like to keep my options open on that third one. I mean, I didn’t know about this role at all, and I love it dearly. What is the best/worst thing about playing Allison? Playing Allison is sometimes scary for me because she’s almost exactly like me in my youth. It’s the best and worst thing. Sometimes I freak out a little thinking, “This feels too easy!!!! Did I really do the work? !” Then we get to really hard part in my lines and I realize, Oh yeah. I did the work alright. 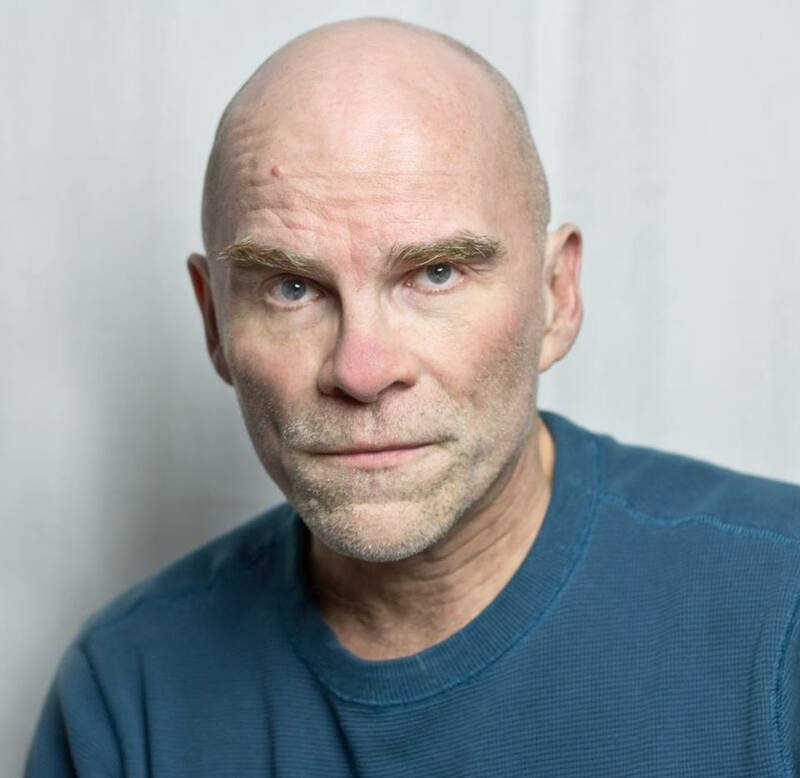 Thanks to MCCT for taking a chance on a fresh face and an out of practice actor. 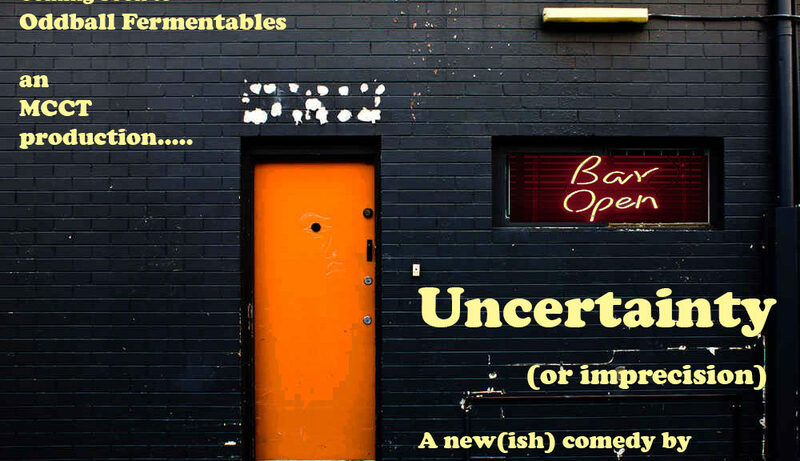 Tickets for Uncertainty are available now! Uncertainty (or Imprecision) by Nicholas Krohn, is a new comedic play about three friends who meet at a bar on the same night to provide moral support for each other as they embark on their respective online dating prospects for the evening. Along for the ride is the bartender supplying the trio with plenty of liquid courage as well as two well-known (and completely out of their respective dimensions) scientists supplying plenty of terrible advice for the trio of friends as they embark on their first physical meeting with the people they have been chatting with online. The dates themselves prove to be one disaster after another in this bizarre and madcap comedy that proves once and for all that dating is the worst, but we all may as well laugh about it. Uncertainty (or Imprecision) will be performed September 9-11 at Oddball Fermentables in Bloomington. Tickets will go on sale in early August! Don’t miss it! We will have sides available and may ask you to read several. We may also ask that you read against different actors for different roles. No prepared materials necessary. Be sure to have an idea of your conflicts, both recurring and single instance, for the period of August 5th, 2018 to October 21st, 2018. 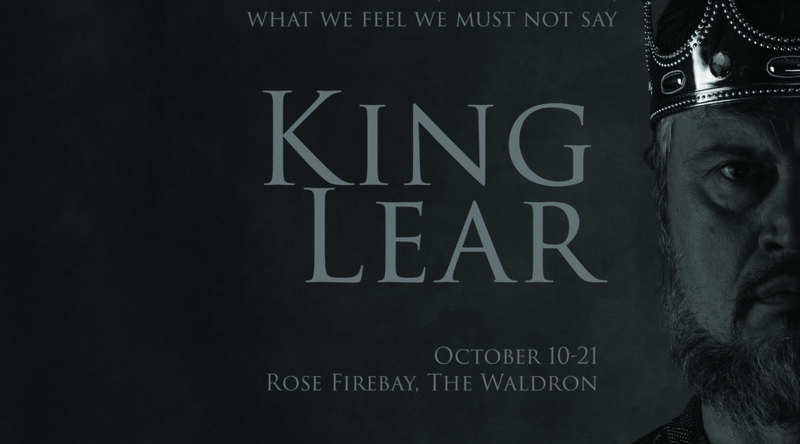 Performances will be from October 12th to October 21st, 2018 at the Rose Firebay, locate in The Ivy Tech Waldron Arts Center. 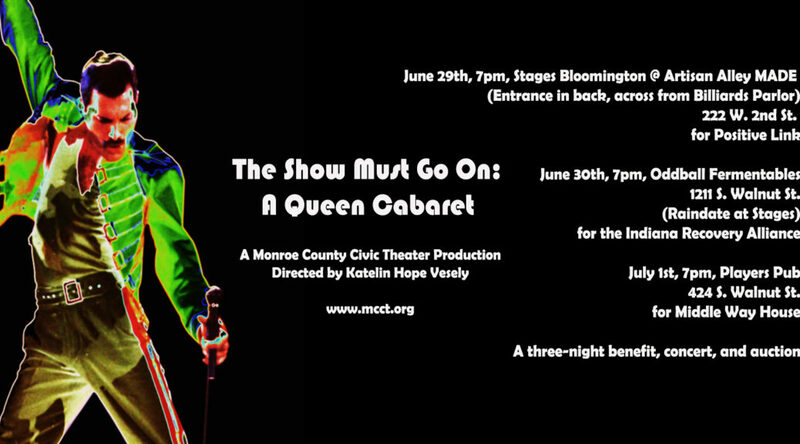 MCCT presents “The Show Must Go On: A Queen Cabaret” as the summer musical theater event that will rock your socks off while allowing you to join us in supporting our several civic partners. This 18-song cabaret will be performed 3 nights, for 3 organizations, in 3 different locations. There will be an auction each night for the featured organization, and all proceeds from ticket sales and donations will be shared evenly. Tickets are on sale now for next weekend’s The Show Must Go On: A Queen Cabaret! Purchase Tickets to the Friday & Sunday show below. Saturday’s show is not ticketed (it’s outside), but donations will be collected. Each night’s performance will benefit a different local organization. So come out, join the fun, and be prepared to bid on some auction items from local businesses and organizations. Uncertainty (or Imprecision) by Nicholas Krohn, is a new comedic play about three friends who meet at a bar on the same night to provide moral support for each other as they embark on their respective online dating prospects for the evening. Along for the ride, is the bartender supplying the trio with plenty of liquid courage, as well as two well-known (and completely out of their respective dimensions) scientists supplying plenty of terrible advice for the trio of friends as they embark on their first physical meeting with the people they have been chatting with online. The dates themselves prove to be one disaster after another in this bizarre and madcap comedy that proves once and for all that dating is the worst, but we all may as well laugh about it. Contact Emily at emily.solt.mcgee@gmail.com for audition times and sides. 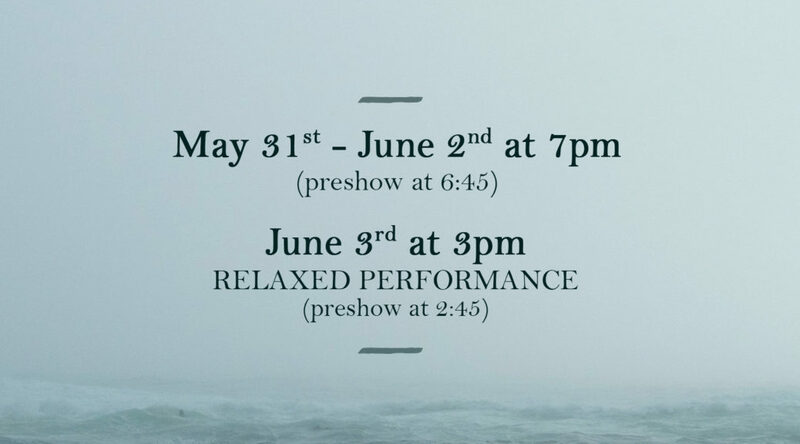 Bloomington, IN – Monroe County Civic Theater, Bloomington’s first and only all-volunteer theater company, is pleased to announce their production of William Shakespeare’s The Tempest May 31-June 3 at Waldron Hill & Buskirk Park in Bloomington, Indiana. The Tempest is a story of magic, mystery, and intrigue as Prospero and his daughter, Miranda, seek their rightful place in the world. Prospero is a powerful magician, and creates a storm at sea to bring enemies to shore and demand his rightful place in the kingdom. Along the way, the audience meets a large cast of characters, from the sprite Ariel to the dark and sinister Caliban. In addition to The Tempest, this Shakespeare in the Park season introduces the MCCT Children’s Theater program with a pre-show performance of Tempest in a Teacup, a shorter version of the story designed to aid the audience in understanding the plot and celebrating young actors. 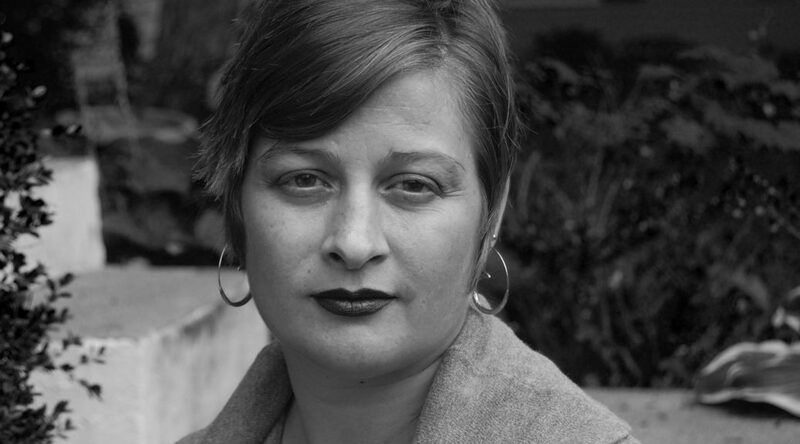 The Tempest is directed by Rory Willats, and Tempest in a Teacup is directed by Jason Lopez. All-told, Shakespeare in the Park combines the talents of over 45 local residents, from acting to behind the scenes work on costumes, sets, and sound. Shakespeare in the Park is always free. Attendees are invited to bring blankets and chairs and make an evening of it. Park restrooms will be available. 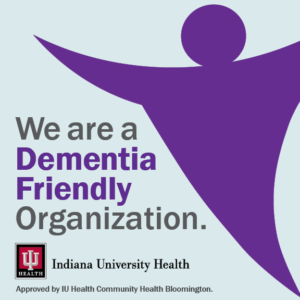 MCCT was recently given the designation of Bloomington’s first Dementia-Friendly theater group from Indiana University Health. The Sunday performance will be a dementia-friendly, relaxed performance.